Stephen R. Covey is known for being one of the most influential people in America. His most famous title is The 7 Habits of Highly Effective People. 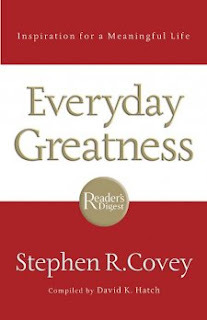 In his collection entitled Everyday Greatness, Covey continues to inspire the masses. The book consists of a collection of essays that were all originally published in Reader’s Digest. Three chapters are devoted to each of the seven sections within. Before every chapter or section, there is an inspirational quote, followed by some commentary. Then follow a few stories, with interspersed commentary, and pages of related quotes. He also includes a section of reflections with questions for the reader at the end of each chapter. For lovers of words, such as myself, this book is full of beauty. Before I had even finished the introduction, I was already sharing quotes from it with a like-minded friend. The stories are moving. The quotes are inspirational. And the reflection questions are thought-provoking enough to keep every journal writer busy for pages. Many productive conversations can also be had from the words within these pages, be they between friends, lovers, family, or scholars. It is meant to be meditated upon and returned to time and time again. While she mainly seems to focus on the relationship a wife has with her husband, she also emphasizes that understanding men assists in relationships with brothers, sons, fathers, and friends. And she often refers to the ultimate father, God. She starts out in Part One trying to explain men and their thought patterns. In Part Two, she guides the woman through expectations, respect, conflict, getting through, and intimacy. 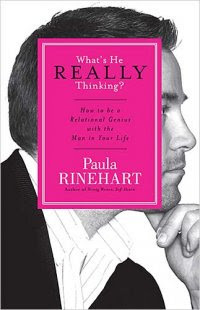 In the appendices at the end, and the Relational Guide, Rinehart provides a workbook of sorts for the woman to use to help her on her quest for Relational Genius with the men in her life. Rinehart uses real-life examples revealed to her through friendships and counseling sessions. She then dissects the situation, explaining it from both the male and female point-of-view. Everything flows together quite well, making this an easy read for any female who has any relationship with a male. Perhaps men could also benefit from reading an interpretation of their actions from a female point of view? Labels: Paula Rinehart, thomas nelson, What's He Really Thinking? On a quest to find books to review for my various websites, I stumbled upon a book publisher called Thomas Nelson via an article I read on Suite 101. They claim to have been around since 1798 and want to give you free books! In exchange for reviewing a book on your blog, and copying the review to a site such as Amazon, they will send you a free copy of a recent publication of your choice. The application process is quite simple. Fill out the form, complete with a link to your blog, and wait for the acceptance email. Then, look at their list of books available to review and make a choice. After you make your choice, you will receive an email with a link to download the first couple of chapters so that you can start reading. Within a week, a hard copy of the book will arrive on your doorstep. Do a review of 150-200 words within a reasonable amount of time. Send them the links to the reviews that you have published, and you will be soon be able to choose another book! Titles and genres vary, but keep in mind that these books tend to be Christian-oriented. They are not necessarily over-the-top Bible-thumping titles, and they can actually be quite beneficial in your day-to-day life. Plus, it will give you great experience to hone your writing skills! Being a single girl, thus a daughter, and with no prospects of being married any time soon, I am hardly the audience to whom this book was intended. Yet advice for a father whose daughter is about to walk down the aisle, or has already walked down the aisle, was intriguing. Dr. Wolgemuth wrote She Still Calls Me Daddy as a follow-up to his previous bestseller She Calls Me Daddy as a guide for fathers whose relationship is inevitably changing with their beloved daughters. He wants to remind them that she no longer belongs to him, but now belongs to another man. He has raised and given away two daughters in marriage, and wants to share his knowledge. Wolgemuth relates the relationship between father and daughter to that of remodeling a house. Therefore, each chapter has a remodeler's checklist. It's a checklist of steps to take in letting your daughter go, how to navigate the changes occurring in the relationship, and how to accept your new son. And of course, the role of faith in your life. It's interesting to read from a daughter's point-of-view, and a book that I hope to one day share with my own father.